Norris Landscaping will provide innovative and unique lighting effects to enhance your landscape, with our wide assortment of low-voltage fixtures. Landscapes can be illuminated on trees, shrubs, statues, sculptures, columns, decks, gazebos, and pergolas. We encourage you to contact us for a free night lighting demo. From the front of your home, to the backyard deck and garden areas, Norris Landscaping works closely with the homeowner to achieve desirable lighting effects. 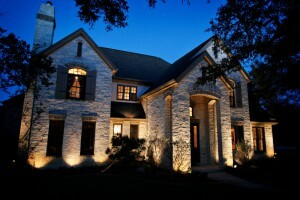 Outdoor lighting can be both functional and appealing. While we have tremendous experience and knowledge in this field, it is also an art to fully understand how much light to apply, and to determine where the optimum focal points are. Rest assured our experts are there to assist you every step of the way. Our evening demonstration will allow you to visualize what effects can be created, and to observe different techniques from which to choose. LED Lighting is widely considered to be the future of landscape lighting. Its long life is a major advantage over traditional lighting, with bulbs being conservatively rated for 50,000 hours, with some lasting up to 70,000 hours. As an illustration, a LED bulb burning 8-hours a night, could last more than 17 years. The lumen output of our 12-volt LED products, are comparable to a 20-watt MR16 bulb. This means you get the same, or greater light output, at roughly half the wattage. In addition, for sheer efficiency, the upfront expense of the LED fixture will pay for itself in the first 5 years of their life, due to using significantly less energy. Investment increases curb appeal, and the value and resale of your home. Both practical and elegant, lighting allows you to enjoy more hours outside, and it creates a wonderful environment for entertaining family and friends. Since our systems are expandable, they are designed to provide pleasurable results today and well into the future. Our solid brass and copper fixtures have a lifetime warranty. This makes your investment essentially worry free. Maintenance agreements are also available for bulb changing and adjustments. Outdoor lighting adds safety and security by deterring trespassers and intruders, thereby, increasing protection for your family and friends. Please give us a call to schedule an on-site meeting to discuss your needs and review our many lighting options.